Finish off your signature burger or fried fish sandwich with this Choice 8 oz. clear squeeze bottle. This bottle's versatile, simple design is ideal for both back-of-house and front-of-house applications. While its open tip eliminates the need to cut off the top, its tight, no-leak cap prevents accidental spills and messes. Bottles themselves are just fine. We have a mobile business though, and bought the caps that Webstaurant sells to use on them. These nozzles are very thick walled, so the caps barely fit on them, and these nozzles don’t have a ridge to hold the cap on either. We were disappointed. If we didn’t need caps, they would work great. If you need caps, you may need to go with another brand. A staple for anyone who has worked in a restaurant, this set is great to have around the house as well, especially for oils like canola and chili. A simple necessity every place should have. They're relatively inexpensive and easy to label and clean. I use multiple ones on the kitchen for condiments like mayo or mustard. Good thickness, screw on lids are great. I use them for my different flavors of simple syrup behind the bar. They hold plenty and squeeze out perfect. A little difficult to squeeze until it’s used a bit. The hole in the top is small for thick and/or chunky dressings. Otherwise work perfectly! These bottles did a great job for me the convenience of not having to transport the sauces in a bowl,they were ready to use at the location. The price was right also. Love the size I think is perfect for sauces that you put on the tables. I noticed buying ketchup bottles is more of a hassle than just refilling these . These are great for sauces but wouldn't recommend for dressings because they are not very big and have to be refilled very often but they are nice. Great quality at unbeatable price. These 8 oz bottles are easy to fill, hold less than the big ones so it is great for a condiment not used a lot but needed. Too fits great with no leak. Awesome find thanks! Slender size makes this perfect dispensing for more fluid products such as extracts, juice garnishes, etc. as opposed to the wider 12 ounce container which is better for us to use thicker liquids. These are a bit small but they do what they are supposed to do. Use them for ice cream syrups and they don't spill or leak out. Great multi-purpose squeeze bottle. We'll be using these more for food prep rather than for customer use, but the quality is superb. At this price, I'm sure we'll be ordering more. The Choice 8 oz Clear Squeeze Bottle is not perfect and will not fit for thicker sauces but if you use it for much more liquid and smooth sauces it will work better. I love these small 8 ounce squeeze bottles. They are priced so that we can fill with our store made dressings and give two with each catering salad. The Choice 8 oz clear squeeze bottle is amazing. So many uses! We use it for sugar water for our cakes, or for condiments when we cater events! Excellent quality little squeeze bottles at a bargain of a price. The plastic is sturdy yet flexible. The top screws on securely and is wide mouth making filling easier. The only thing missing is a little cap. These squeeze bottles are standard throughout the industry. The 8 oz. is great for fine detail work or a very concentrated sauce. My only complaint is the opening of the tip is a little larger than I would like. Not a deal breaker though. Always order these to add to party trays. Inexpensive and if people don’t return them there is no loss to us as the price is covered in the cost of party trays. Absolutely love these bottles, very versatile, durable, inexpensive. Perfect for catering since they are cheap enough to leave with clients when dropping off salad dressings and sauces. A tip to fill them with out spilling: Put your thick sauces or dressings in a ziplock bag and pipe it in from a corner. 8 oz squeeze bottles are helpful in presentation and plate decorations. If you utilize the same major ingredients, it pays to keep a few of these filled and on hand for easy access in the kitchen. These boils are perfect for drizzling chocolate. We put the melted chocolate in the bottle and keep it in a warm bowl to keep it from hardening. They work great. I use these to hold different oils for squirting into pans when cooking and it does a marvelous job at this. I used a sharpie to mark each one for knowledge of which oil goes in which bottle before cooking with it and they haven't lost the markings through a few dishwasher cycles. These squeeze bottles are great! They can withstand drastic temperature changes from going through the dishwasher to sitting in a warmer to being in the cooler and the plastic does not get warped or have any change. The plastic is also very thick and durable. Very satisfied and will definitely purchase again. Great for small quantities of sauces and oils. I use them at home for the many different oils I like to have handy. The nozzle has a pretty decent size hole too so things won't get caught. These bottles are great for finesse works where accuracy is a must. They are extremely easy to clean are are safe to use in the dishwasher. I love these for storing various homemade salad dressings in. I like to lay down saran wrap under the lid before screwing it on to prevent air from getting in. Cleaning can be tricky, you need something that can reach down into it. These squeeze bottles are a great value. Excellent quality, especially for the low price. They are easy to fill and dispense. I am very happy with my purchase. These squeeze bottles work great for thinner sauces and liquids. The lid isn't quite airtight and there is no cover on the top, so air does get into whatever product you keep in this. I use this not only for dispensing condiments, but also for cooking oil. Because I buy oil in bulk, this squeeze bottle is great to control the amount of oil. It would have been even better if the bottle had a cap just like smaller size (also sold here) has, but I just use some plastic wrap. I am planning to buy 16 oz as well for heavily-used condiment. We use these 8 oz squeeze bottles for holding liquids such as lemon juice or canola oil. They are dishwasher safe and are relatively tolerant to high heat. These squeeze bottles are nice and small and perfect for picnics or bbqs alike. They are inexpensive enough that you can even discard of them after and order a new set! these are great for table servings, easy to squeeze. Cleaning them however was difficult. They are in expensive and i will definitely get them again. I love these squeeze bottles. They are great for oil, vinegar, or whatever other condiments you'd like to put in them. The plastic is thick but not so much that it's hard to squeeze. I use these bottles to store various oils for quick access and usage during cooking. Also, we like to make our sauces to put in these bottles for our bbq parties. These bottles are excellent for toppings from sprinkles to butterscotch to Nutella to nerds... and more. They are very study and really easy to clean. We use them every day in our frozen yogurt shop. Works great. I wish it were clear instead of a little cloudy because it would look more attractive in the few times the customer sees it. It's a little less sturdy in terms of quality than I thought it would be. These 8oz squeeze bottles are handy to have around for so many different uses. I use them for different oils, melted chocolate for decorating, condiments, etc. These uses are endless and their so affordable. These squeeze bottles are great! Especially for decorating the coffee drinks at the shop as week as using them for mayo, mustard, and ketchup. These are def worth it!!!! Nice sturdy yet flexible squeeze bottles. They last a long time and you can fulfill it with any sauce you want. The perfect size for medium sauce or drizzle applications. I will buy them again in the future. Great price also. 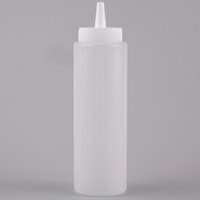 This size squeeze bottle has been perfect for some of the custom sauces I make. It's large enough to hold a good amount of sauce, but still small enough to use for decorative plating. They've been great for me. This item definitely exceeded my expectations. The price is very reasonable and the quality is excellent. I would highly recommend this product. 5 star product! I purchased for home use. They are perfect for popcorn butter topping! I store these with various types of chocolate and candy melts in the fridge, labeled and ready to use at all times. These are microwavable as well. These are perfect for some of my homemade salad dresssings and bbq sauces. They're easy to clean with warm water, and the price is good for the amount. Most utensils I buy on here I buy one in each size to test out and always return for a couple more in each size, these are perfect for my needs. I only wishes these had covers for the tips. Great bottles - nice size and can be used for a variety of things. I just wish they had a small top to cover the opening. But, otherwise they are fine. Reliable and handy, just as expected. I just wish that tips for the bottles were included. When storing the bottle in the fridge, the open tips allow the contents to absorb odors in the fridge. Didn't expect these to last long since we are using it in our handmade soapmaking process - lye is harsh on plastic tool usually but... after 2 years of use, they are still going! Sturdy enough for hold hot liquid without becoming all soft and squeeze easily for a perfect control of the drizzling. Will replace them eventually but still not an emergency at this point. Good investment. No regrets. We use this small bottles for our less frequent or small amount ingredients or products. It¨s easy to use and easy to adjust to any kind of content. Nice sturdy yet flexible squeeze bottles. The perfect size for medium sauce or drizzle applications. They will stain a bit but they clean up nice. Just got these in the mail yesterday and started to fill up some bottles. They're extremely handy when you're cooking Asian stir-fry and need like 5 different ones in a whim. Instead of opening up individual jars one at a time, I just transferred the contents of my soy sauce, sriracha, and oil into these containers and they work like a charm when cooking! Easy to use. One recommendation though is that I wish these came with tiny caps like the smaller 4 oz and 2 oz bottles on this site. I use these at the restaurant where I bartend. They are great skinny bottles for sauces. I also use them for sauces such as caramel and chocolate when dressing up a dessert! These squeeze bottles are a perfect size for holding all kinds of sauces. We especially thought they worked well with salsas, but I can't wait to get more to drizzle chocolate and other sauces over lattes. These are good quality squeeze bottles, that hold the perfect amount of a salad dressing or sauce. The rubber is very flexible, so they are good with thick dressings or sauces. The tips may be a little small, but can be cut to increase the flow of sauce. Good buy. These are fantastic bottles with a disposable price. I've yet to wear one out but when I do, the price is so good that I won't cry about having to toss it and grab a new one. My favorite thing to store in these is my sisamioils. It's so easy to get exactly the amount that I need. These squeeze bottles made serving condiments much less tacky then the actual oversized original condiment packaging (bulk). They ensured the condiment portion of the table remained "mess" free, were easy to fill, clean and will be used both in front and back of the "house" for my cooking and serving needs. I use these 8 oz Clear Squeeze Bottles every day. Not only are they handy in the kitchen, but our patrons can use them at their tables, or from a condiment table. They are easy to fill, and it is easy to see what is contained within them, they are a must have item in my restaurant. I like the size of these, as they hold just enough for most tasks. I use them for sauces and i find that the stream that comes out is a nice amount. The only thing i wish is that they came with caps for the tip, but other than that they suit my needs. Great size bottle at an awesome price. I make a lot of cake pops, and use these to drizzle a second color on top. The holes in the caps are slightly larger than I was expecting, but still work well for what I intended. As a test I squeezed water out of the 8 oz. Clear Squeeze Bottle - 6 / Pack. I saw by the way I squeeze the bottle determines how much liquid will actually come out. Good to know I still have some control. Glad with the purchase. I bought these to put condiments in. I bought the wrong size thinking they were bigger. Nevertheless we used them still and are satisfied with them! This tiny bottle has a medium-sized opening. It works great with thicker liquid such as condensed milk. I am very satisfied with the product. I will be purchasing more if needed. like these bottles an would recommend them, i like that you can cut the tip down to the right width for accommodate the sauce you are trying to serve. We bought these to use in our food truck. We put vinegar, olive oil and chicken stock in it to make it easier for our chef to access. We use these bottles everyday in our cupcake shop. We transfer our extracts from the large bottles they come in - into these bottles - so it makes it easier to measure small amounts. We also use it for cupcake toppings - like caramel - to decorate the tops of our cupcakes. These squeeze bottles were good quality. We used these in an unusual way and were very pleased with the result. We used them to make sand art at our school carnival. Each bottle had a different color sand. This controlled the mess better than the traditional method of using spoons and funnels. They were a great size, holding about a lb. of sand each. The kids had fun! These bottles are great for catering. They are large enough for several servings of sauce but small enough that we are able to offer 2 bottles for variety with each order. They are also inexpensive enough to give away, but high quality so they can be reused by the customer. You can use these to store homemade salad dressing and other sauces. Just cover the spout with a layer of plastic wrap. Also if you have something thick/chunky in them you can cut the tip off the bottle a little bit. Standard squeeze bottles but they definitely retain anything you leave in thems color. Our hot sauce stained them in a day and they now have a faint hue. Microwavable! Good quality for the price. Of course like many other plastic products, if darker or oiler liquids are stored, the squeeze bottles tend to hold the color. These work great for our baristas who use them to store our simple syrup and chocolate syrup. Easy and clean to use. Just squeeze into the drink and mix. These squeeze bottles are obviously very simple but definitely come in handy when I don't want to carry bulky ketchup and mustard bottles. They are also listed at a great price. If you are just starting up a food service business, I would recommend this product, or those like it depending on your situation. Good, simple squeeze bottles. Nothing fancy about them, they are a good size for smaller amounts of dressings, garnishes, etc. FIFO are easier to clean though. These are very small bottles, so if you are looking for something more standard size, make sure you try the 24oz bottles instead. These are perfect for desserts or any dish you need those extra special little touches on. These are the perfect bottles for homemade salad dressings. I also use one for olive oil and one for balsamic oil. Makes those two essentials so easy to access. I even keep white vinegar in one for cleaning. Nice small squeeze bottle for customers. But these bottles are perfect size for us because we give out free bottles of sauces for large orders. These squeeze bottles are so handy to have during the holidays. I make holiday truffles every year and I decorate the tops with chocolate drizzle - thats why these are so perfect. The drizzle is even and makes very little mess or waste, and when the chocolate hardens up, I just pop the bottle in the microwave to get the consistency back. This is exactly what I was looking for! The size is just right and I love that it's clear. Super cheap, but the quality is great. I used the squeeze bottle for drizzling sauces onto plates. Its spout is very accurate so the sauce gets exactly to where it is supposed to go. This is a very good bottle. I have also suggested its use at the non-profit that I work for to use the bottles as a vessel to distribute Diatamaceous Earth to our clients. These Squeezes work OKAY. I was actually looking for a bottle that had a bigger mouth opening and tip. We use them and they work; it would just be easier if bigger on the top. good sized bottles for oils, sauces, or purees. do because how hard you squeeze because more fluid products like oil tends to leak from the cap. A great sized bottle for working with melted chocolate. Easy to use and very easy to fill. The mouth on this bottle is nice and wide. I used these to fill homemade sauces for the restaurant and they're great! Just big enough to keep fresh and the best price you will find. Great price. Just as nice as the ones at the high priced kitchen or restaurant supply stores. Love them for sauces and chocolate sauce. Price is so good if one gets ruined no worries, just toss it! We use these bottles everyday to hold and apply various sauces from Barbeque sauce to our special Worcestershire sauce. They are great because they clean up easily and won't stain. The use of these has decreased the oil usage for the grill. My food products are tasting better and I am saving money. Win! Win! These bottles are little in size, but large in uses! We use them for homemade dessert sauces and bbq sauces. They are a sturdy plastic, and will hold up to many uses! Thanks for the review! You could try the Tablecraft 1104 Chef Squeeze 4 oz. squeeze bottle, (item # 8081104) which comes with a red closure cap for safe storage. Great bottle for multipurpose use. Clean so it is easy to identify a sauce or dressing, and it is easy to clean, this bottle is great. Only complaint is the cap hole is a bit too large to do fine streaking on a plate with the sauce. I ORDERED THESE FOR MY HALF&HALF CREAMER. Since creamer cannot be left out very long before it spoils, I use these to squirt the creamer in my cup instead of having to open the carton and pour into my cup each time I have a cup.I can also keep some creamer in my home office frig. They are much better quality than what I had. The lids screw on securely whereas the ones I had made a mess each time I used them. And I got a pk. of six for what I paid for 2 of the inferior ones! Thanks Webstaurantstore! (Notice I'm using mugs from WSS also; they keep my coffee hot twice as long as other cups. These little bottles are awesome - I keep various types of oil in them, and then it's really easy to drizzle them into a skillet on the stove, and when I buy the big containers of oil at costco, I don't have the lift up the heavy containers each time I want to use the oil. Great squeeze bottles! Good for condiments and so much more! Great price! Good for sauces, oil, salad dressings and even some purees! Easy to clean!!! These bottles work perfectly for flood icing for my cookies and will, of course, be perfect for any syrups or glazes you can fill them with. The only drawback is that they do not come with caps for the spouts, so you cannot store any of your syrups in these bottles.